The University has established itself as an innovative center of higher learning that is dedicated to teaching, research, and service throughout all of its programs. 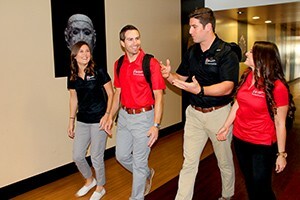 The philosophy of the DPT program is to attract a dynamic and diverse faculty who possess a common desire to shape the physical therapists of tomorrow by modeling both clinical and teaching excellence. By design, the DPT program will expand on the progressive model of the University by incorporating advances in educational theory and technology in the development and implementation of the program. Learning is enhanced in a learner-centered model of education, where students are actively involved in the learning process. This model of education recognizes multiple methods for effectively engaging students in their learning that includes lecture, online, skills laboratories, group discussions and inquiry, case-studies, student presentations, independent study, writing components, and clinical experience. Teacher-student collaboration in the educational process increasingly encourages students to take responsibility for their own learning, discovery, and application of new knowledge, and skills. Practical application and clinical education occur at appropriate intervals throughout the curriculum. This sequencing of learning recognizes the importance of active and clinically relevant learning. Student learning is enhanced when the faculty model encourages critical reflection. In discussions of clinical cases, the faculty actively considers interpretations, develop hypotheses, and present intervention strategies that are integrated into existing or new cognitive frameworks or schemes. A balance of open-mindedness and questioning is demonstrated using varied teaching strategies and patient management approaches. Course content builds on the student’s existing knowledge base, progressing from simple to complex conceptualization and advancing from concrete to abstract analysis. Program activities and curricular content are not focused solely on improving technical skills and knowledge, but also facilitate development of the student as a professional. Student development of core values and skills is enhanced through appropriate faculty interaction and modeling of professional behaviors and attitudes. Assessment of student learning and preparation for clinical practice is an intentional and integrated component of student learning. Assessment methods attempt to facilitate understanding rather than rote memorization and include a variety of evaluation methods, including ability-based assessment used to facilitate the use of knowledge and psychomotor skills. The DPT program faculty recognizes that even with the best curriculum and technology, the heart and soul of the program are the students. The program will work to select and educate highly motivated students who desire to be active participants in their education. SDSU graduates will be prepared to enter the physical therapy work force as skilled and ethical members of the health care community.